West Dundee, IL – July 2, 2018 – Renishaw, a precision engineering and manufacturing technologies company, is showcasing its diverse technology portfolio and extensive experience in automated process control at IMTS 2018 on September 10 - 15 in Chicago. Renishaw is demonstrating its range of smart factory process control solutions, which are proven to help machine shops across many industries transform their production capabilities. Renishaw’s product portfolio supports the full spectrum of industrial metrology applications, delivering benefits in speed, ease-of-use and flexibility, which help manufacturers integrate smart factory technologies of the future into their existing operations today. A high-productivity machining cell, featuring fully integrated process control, will be on display at Renishaw’s main booth (No. 135509) in the Quality Assurance pavilion (East Building, Level 3). This exhibit will demonstrate how high levels of automation and connectivity can be incorporated into CNC machining operations to improve productivity and process capability. The demo cell reflects process control techniques that Renishaw applies in its own factories to deliver highly automated precision manufacturing. More and more manufacturers are recognizing the significant benefits of having the flexibility to re-purpose equipment to accommodate shorter product life cycles and increased design variants. At IMTS, Renishaw will showcase innovative technology that brings this level of flexibility to the automotive and aerospace manufacturing industries. For example, the multi-sensor capability of the REVO™ system on coordinate measuring machines (CMMs) will be demonstrated. This system’s ability to rapidly acquire data about dimensional and surface finish characteristics on a single platform allows manufacturers to significantly reduce measuring time and provides actionable data more quickly. 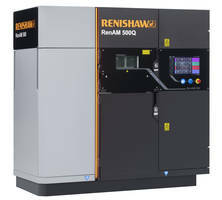 In addition, the increased flexibility and application range of the Renishaw Equator™ gauging system will be exhibited. The new Equator 500 accommodates larger parts, and the introduction of IPC (intelligent process control) software allows manufacturers to automate process control and tool offset correction directly to CNC machines from any Equator gauge. IMTS 2018 visitors will also see the latest developments in Renishaw software, which deliver improved ease-of-use as metrology moves closer to the point of manufacture on the shop floor. These include MODUS™ 2 software for CMMs and Equator gauging systems, mobile apps for on-machine probing and CNC controller-based apps for probing and reporting. In the 3D Printing and Additive Manufacturing pavilion (West Building, Level 3), Renishaw is showcasing its latest AM system and software (Booth No. 431607). The new multi-laser RenAM 500Q increases productivity in the most commonly used machine platform size. Renishaw’s suite of AM software includes QuantAM build preparation software, InfiniAM Central remote process monitoring and InfiniAM Spectral for live feedback on energy input and emissions from the AM build process. To remain globally competitive, manufacturers must satisfy the need for parts machined to closer tolerances, reduced product life cycles and increasingly consumer-driven demand for product variety. This, coupled with a need for increased factory automation, requires a range of intelligent process control solutions throughout the factory. Manufacturers find that partnering with Renishaw’s process control experts offers them an unrivalled breadth of experience and product solutions, which help them to achieve smarter manufacturing processes. They benefit from optimum quality, efficiency and resource utilization on the shop floor. For further information about Renishaw as a partner for innovative manufacturing at IMTS 2018, visit http://www.renishaw.com/imts. Renishaw is one of the world's leading engineering and scientific technology companies, with expertise in precision measurement and healthcare. The company supplies products and services used in applications as diverse as jet engine and wind turbine manufacture, through to dentistry and brain surgery. It is also a world leader in the field of additive manufacturing (also referred to as 3D printing), where it designs and makes industrial machines that “print” parts from metal powder.